aith to Action Network began in October 2010 when Christian Connections for International Health (CCIH), Muhammadiyah and DSW (Deutsche Stiftung Weltbevoelkerung) undertook a feasibility study and organized participatory consultations to investigate the strategic and practical considerations of working globally across faiths to realise better family planning and reproductive health funding and supportive policies (internal and external to faith organisations). As a climax of the consultations, a meeting with leaders from diverse religions and regions across the globe took place in June 2011 in Nairobi, Kenya, resulting in the ground breaking Interfaith Declaration to improve family health and wellbeing otherwise known as Nairobi Declaration. 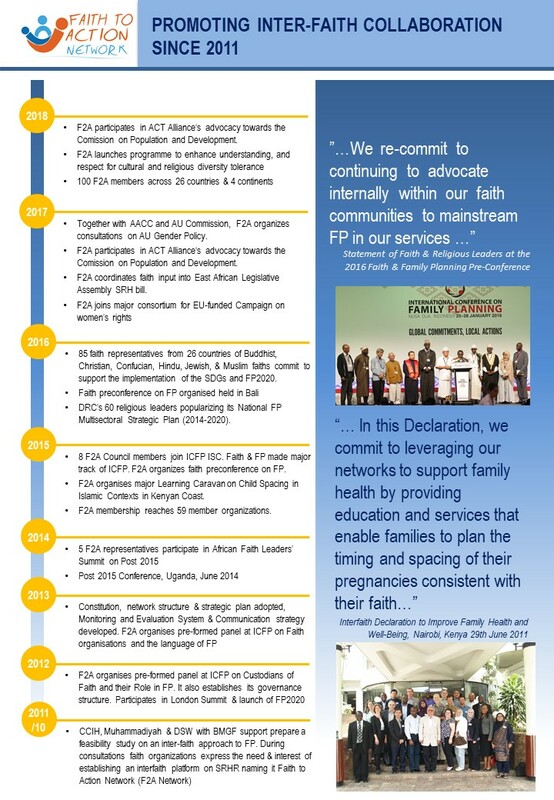 In this declaration, faith leaders committed to leveraging their networks to support families to have increased access to information and quality services on family planning and reproductive health consistent with their faith. They mandated the establishment of a global interfaith network (Faith to Action Network) to promote dialogue, build the technical and financial capacity of faith organisations and religious institutions and facilitate sustained joint advocacy and programming in support of family health and wellbeing. In a meeting held in December 2012 in Addis Ababa, the structure of the Faith to Action Network as well as its operational and coordination mechanisms were agreed upon. With a structure and mechanism in place, the Network was officially launched in November 2013 in Addis Ababa, Ethiopia.